Sell My Car For Cash Fast » Blog » Sell Car » Sell It or Keep It? Best Option for a Scrap Car in Brisbane? Every article that an individual purchase is essential to them. All things have some utility that makes it a reasonable buy. That is why most people are in two minds when the time comes to decide whether to keep something or sell it. There are a few factors that individuals take into consideration before they plan to sell anything. Few considerations are the price, quality, duration of use and present market value of the article. People even try to repair things that are dear to them. Only when the damage is beyond repair do they consider selling it.The same situation holds true in case of a car. The car is an expensive commodity, so people want to make the most use of the car. However, like every other article, a car also has a limited service life. Once this duration is over, the owner may have to face various problems. The car may refuse to start, it may suffer damages from natural calamities and accidents, have missing parts, auto parts may become faulty, etc. In such a situation, car owners face the dilemma of either selling the car or keeping it. However, in the case of scrap cars, it is always advisable to sell the car. Where to sell your scrap cars? Nowadays, there are various firms that offer their services to purchase old, scrap and junk cars. QLD Sell My Car Brisbane is one such firm that helps car owners get rid of their scrap cars. These service providers buy cars in exchange for great prices which makes such deals profitable. It gives an opportunity for the owners to earn cash instead of paying the expenses to maintain a scrap car. 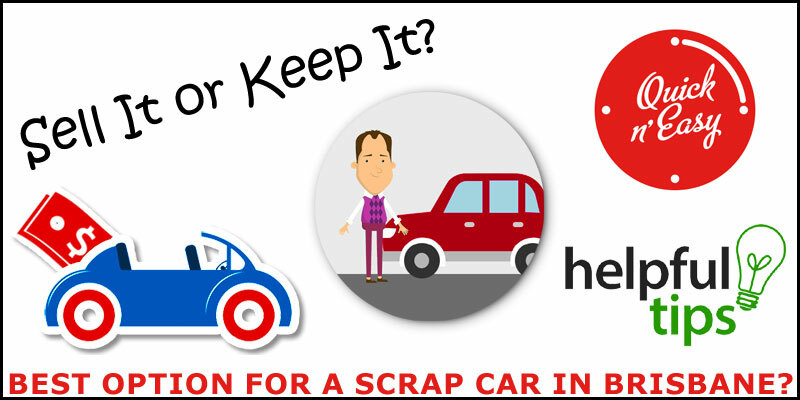 A scrap car is of no use as it does not function properly. It turns into a liability as the owner has to pay for the rent of the garage and maintenance. To add to all these expenses, the owner has to invest quite an amount of space in his/her residence to shelter the car. This space can be useful to store other things rather than a non-functioning car.The firms offer good cash price for the scrap cars and also provide all the necessary services that facilitate the process to continue smoothly. The firm takes the responsibility of providing pick-up services, car assessment services, and price estimate services, free of cost. Usually, the owners have to bear such expenses, so the firm allows them to keep a larger margin for profit. Once the individual decides to sell his/her scrap car to firms like Sell My Car, Brisbane, he/she has to contact the firm. The contact number is easily available on the company’s website. Representatives from the companies get into contact with the individual and gather all the necessary information about the scrap car. The individual has to choose a date, time and location to set up a meeting with a professional from the wrecking company. This is done to ensure that the deal is convenient for the seller. The professional visits the seller’s location to make a free assessment of the car and offer an estimated price that the firm is willing to pay in exchange for the car. If the owner agrees to the terms, the wreckers make provisions to remove the car as soon as possible and make the payment in cash.There are various centres of wrecking firms across different locations. People can avail of these services from any place, even if they live in interior locations.